Zimbabwe, officially the Republic of Zimbabwe, is a landlocked country located in southern Africa, between the Zambezi and Limpopo rivers. It is bordered by South Africa to the south, Botswana to the southwest, Zambia to the northwest and Mozambique to the east. The capital is Harare. 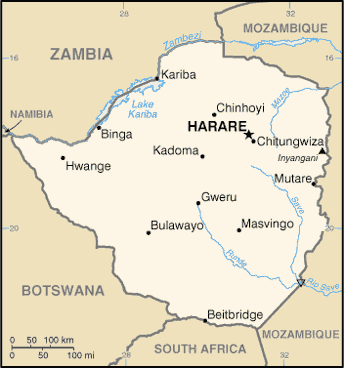 Zimbabwe achieved de jure sovereignty from the United Kingdom in April 1980, following 14 years as an unrecognised state under the conservative white minority government of Rhodesia, which unilaterally declared independence in 1965.